Another year of blogging is in the books at Palouse Wargaming Journal as the ledger closes on Year 6 in the journey of chronicling my hobby activities. French & Indian War Solo Relay Campaign - with the cooperation and dedication of Peter at Grid Based Wargaming, a SYW campaign raged over five months as I took on the operational role of administering the campaign via the boardgame, Montcalm & Wolfe while Peter resolved each action on his gaming table. That was great fun. Seven Years War/War of Austrian Succession Gaming - the battle of Mollwitz saw action on the gaming table twice (or was it three times?) and the battle of Zorndorf once. More battles of Zorndorf are expected in the future. I watched Jake's (Dartfrog's Adventures in 6mm) Russian SYW project begin and end with the result being the mustering of the Russian OOB for Zorndorf. The guys have seemingly accepted Honours of War as a satisfactory set of SYW rules. ACW Gaming in 10mm - I tried my hand at scenario design using Norm's (Battlefields and Warriors) ACW rules, Two Flags - One Nation for the action at Fox's Gap. Played that scenario several times; some solo and a few FtF. Plans for getting TF-ON back out onto the gaming table before year-end is anticipated. To The Strongest - Finally got a chance to give To the Strongest rules a try on the gaming table at Chaeronea. Although I went down in defeat in the first playing, I am impressed by the simplicity and nuance of the game. I look forward to many more repeats of this one. Napoleonics Gaming - Returned to the Peninsula to fight the action at Foz d'Arouce multiple times in 28mm. Great to get this collection out onto the gaming table after so long in storage. Of course, a smattering of travelogues occasionally popped up with many more in the bin to share in the future. Besides reaching a milestone of six years blogging, The Palouse Wargaming Journal approaches 1,000 posts. Perhaps by Christmas that milestone will be reached? Besides curating a large amount of information on my hobby activities, the most rewarding benefit gained is the introduction to a number of like-minded individuals. Friendships gained through these communications are important and appreciated. this reflective summarization has not wavered. To show my appreciation and gratitude to those who stop by for an occasional visit or regular readers who not only take the time for a visit but also to compose a reply, I offer a drawing for a gift card or three. Publicly follow the blog by clicking on the "Follow" button (if you have not already done so). Leave a comment to this post declaring your wish be entered into the drawing. Top Commenter Bonus: To reward the Top Commenters and to encourage others toward more frequent contributions, the Top 10 will receive additional weightings to their entries. For the verbose Top 10, to your singular entry, you will receive additional entries equal to the inverse order of your ranking. That is, Mark Strachan gets ten more entries while Stew receives one additional entry. Rankings will be taken at time of contest closure. Publicize the Contest: If a contestant is, perhaps, willing to reduce the probability of winning by prompting others to join in, publicize this Give-Away on your blog. Put a link back to your blog in the comments for verification. In exchange for possibly diluting your change of winning, you get five extra entries. Favorite Post in Year 6: For an extra five entries, identify one of your favorite postings in the past year and why. If your winning entry is pulled from the Random Sampling (without replacement) hat, the winner will receive an electronic gift card to the wargaming vendor of choice. It is the winner's choice but the vendor must offer the purchase and delivery of an electronic gift card. Amazon.com is an example of a book vendor fitting this criteria as are Eureka Miniatures, Brigade Games, and Newline Designs. There are many others. If the winner can find a vendor offering this capability, gift card will be purchased and voucher sent on via email. 1 x USD $50.00 and 2 x USD $25.00 Gift Cards will be awarded. Heck, I'm in! :-) I will do a publicity post for you this weekend. I seem to have let Mark and Iain pass me on the leader board - for shame! Congrats on 6 years of the Journal; I started "Blunders" just about 9 months before your blog. I am glad you enjoyed TTS! It is a remarkably clever and elegant system. I plan to use a version of it for a Great Italian Wars game in a few weeks. That's great, Peter! You are maximizing your changes too for a prize. TtS! was very fun and a little frustrating too. I look forward to more games of it and I am especially looking forward to seeing your Great Italians Wars game on grid. I STILL need to get my GIW collection onto the gaming table. Yes, TTS! can be a bit frustrating if you have a talent for pulling Aces! I learned a lot in that first game especially the importance of command management. Next time, I will be better prepared to deal with aces and failed activations. TtS! provides interesting challenges and decisions. Congrats on the 6 year birthday of Palouse Wargames Journal!! Count me in too please Jonathan. And also your great looking Spanish Reconquista command stand. A quick question Palouse? Is that where you live? Good to have you on board for the drawing, Ray! The Palouse is a region in SE Washington State/NE Oregon State/North Idaho. I live on the northern boundary of the Palouse. Always a pleasure dropping in on your blog to see what you are up to as well. 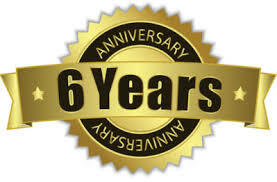 Congratulations on 6 years of blooging and for your unstinting support of other peoples blogs. Happily, I won one of the prizes the last time you did this, so this time, I will just sit out of the contest and watch from the sidelines. Good luck to everyone entering. Cheers Norm. Thank you, Norm! You show just as much support for fellow bloggers as I so am not not extraordinary in that regard. Bypassing a chance for free stuff? Amazing! Happy 6th Birthday! As an improbable award winner last time, I would defer on the lottery this time around (bad karma to push one's luck). But, I will say that of all the excellent content you've put up, the March 7 Chichen Itza travelogue sticks with me: swimming in that cenote after relating the story of the first one: wowsa! Your blog is one of my staples: appreciate it very much. Looking forward to more. The Chichen Itza visit was a good one and glad you enjoyed it. Gee, no one wants free stuff? Congratulations on your milestone Jonathan... I was just commenting to Mar (1866...) on Friday that whenever I check your blog, you have 20-30 comments, whereas I count myself lucky to get half a dozen, so you are obviously doing something right! I am happy to put a mention of your competition on my blog but I doubt it will reach anyone who is not already a regular visitor here! Thank you and thank you for posting a plug on your blog for the drawing. I wish you good luck in the contest. Well, I added your blog to the list of blogs followed, so you may expect a few more comments from me. Congrats sir! One of my favourite to look and read blog! Thank you so much, Michal! Your continued support is appreciated! Well done on six years! As I was a winner last time I'll opt out this time my favourite post is between the church Ray mentioned (love to see it in a Rennaisance bat rep) and the Italian 1859 18mm project,not a scale I'll do or a period I'll do but nice to look at! Thanks, Iain! It is your support and support of others that motivate me to continue. I like the church and would enjoy seeing it on a Renaissance battlefield in the near future. The 1859 project is a favorite too. Perhaps one of my favorite periods to paint. It is always a pleasure to pop in and see what you are doing. Always a pleasure to have you pop in for a visit, Aly! and am very happy to do so. I'm going to nominate as my favourite post of the last year the one about hiking from a month or so ago, not just because it looked lovely, but because the concept of driving 'only 60 miles' to go for a walk made me smile. Thank you for promoting this event! Glad to read that driving to take a hike amused you. I left out a few notable anecdotes from that hike. One was that early in the hike, Dustin, walking on point with his dog, announced that he saw a bear cub poking its head out from the underbrush. Well, seeing a bear cub likely means momma is not too far away. After a brief discussion about turning back and bemoaning our lack of bear spray, we continued on concluding that we make enough noise during our trekking so as not to surprise anything. No other predators were spotted. Well done Jonathan! Your enthusiasm and support for other bloggers is appreciated and applauded. Remember that you have to explicitly;y state that you want into the drawing. Good luck, chaps! Peter! You get points for style and altruism! Your encouragement of others to enter the drawing reduces your chance to pick up a winning entry. Perhaps we all have too much stuff? Always a pleasure to come here, admire photos and read your reports but...Already 6 years? Oh, my, time passes so fast! Hey, btw, count me in please, and congrats for the milestone! Thanks, Phil! You are in! Congratulations Jonathan. I'd love to be in the draw. I'm surprised to see my own modest contribution to the blogosphere is roughly 5 now. Crazy how the time flies by. I have trouble pointing at a specific post I like best, but the joint French Indian War series was fantastic. I really like seeing board games as campaign systems hit the table. I'm also really jazzed to see when multiple blogs work together to make great things happen. It's a sterling example of the awesomeness of blogging as a community forum. You picked a good series to single out. The FIW campaign was enjoyable and Peter did a splendid job in setting up and resolving every battle that the campaign threw against him. Without Peter's dedication, this would not have been a successful undertaking. Welcome aboard and you are entered into the drawing! Well done on 6 years of blogging. Please add me to the draw. Many thanks. Thanks, Peter! You are entered into the drawing. I've always enjoyed reading your blog over the past years and congratulate you on your 6th year! Hard to say which blog post is my favorite as I find many interesting! Christopher, your support has been a constant throughout these years and is much appreciated. Do you want to through your hat into the ring for the contest? I would like to enter said competition Jonathan! Fran, you are in! Good luck! Aaron, you are most kind! Do you want an entry into the drawing? That’s the spirit, Aaron! Thanks for playing. Congrats on 6 years Jon! That must feel like forever. I really enjoy your blog and greatly appreciate your posts. You are a blogging role model for me. And I'm totally in for the contest! because I never outgrew being a starving student and can't walk by hand outs! My favorite post is the one talking about spray varnish...kidding! I really enjoyed the series of posts of the scenario with the river / church and I can't believe I'm blanking on the title because I just looked a second ago...wait i wrote it down.. "foz de Arouce"
Also bunker Hill was a fun post, and I can pronounce it. Though I doubt that anyone who is aware of my tiny blog is also not aware of yours. Thank you, Stew! You are in the drawing and have maximized the entries available to you. I liked the post concerning spray vanishes but Foz d'Arouce was one of my favorites as well. I appreciate your support and interest in the PWJ, Stew! I reckon I will keep at it. Congratulations on the anniversary Jonathan, and yes I'll enter the draw! Thank you, Mark! You are entered in the drawing with maximum extra entries. Pleased to see that you are enjoying the early Napoleonics project. The 1799 project is a favorite of mine too. The project has reached the "gameable" state so many battles are within reach. Montebello 1800 was a fun contest that replayed several times. Next up in the early Wars of coalition will be Rivoli. Still working on the OB but expect the game later fourth quarter. Well done for reaching your iron anniversary. Considering we’ve frequented a lot of the same blogs in the lovely little community of ours for years, how is it I’ve only now come across your blog Jon? Consider that a lack of good sense on my part. I’ll endeavour to visit as regularly from here on in as free time allows. Congrats on the anniversary. My own 8th year blogging anniversary is soon to arrive and I still find it hard to think I have kept that old stale thing chugging along somehow. Welcome, Dai! Thanks for becoming a Follower and posting a comment upon your first visit. Commendable! Your are a Follower and posted a comment with a desire to enter the drawing. That is good enough for me. I will throw a chit into the drawing for you. Who knows? It may be a case of beginner's luck? I hope to see you stop by and leave a comment or two when you can. Congrats Jon, your blog continues to be an excellent resource for the rest of us. Thanks much, Jake! We all inspire one another, I think. What To Do With Prone Figures?